U.S. and French Presidents agree on a joint response in the event of another chemical attack in Syria. U.S. President Donald Trump and his French counterpart, Emmanuel Macron, agreed Tuesday on a joint response in the event of another chemical attack in Syria, AFP reported. The tough language, in a phone call between the two leaders, came a day after the White House said that President Bashar Al-Assad's regime was preparing a potential chemical weapons attack. Trump and Macron agreed Tuesday on "the need to work on a joint response in the event of a chemical attacks in Syria", according to AFP. On Monday, White House press secretary Sean Spicer said that U.S. intelligence agencies have evidence suggesting the Syrian government is preparing for a large-scale chemical attack, similar to the strike near the city of Idlib in April which left dozens dead and hundreds more with serious injuries. 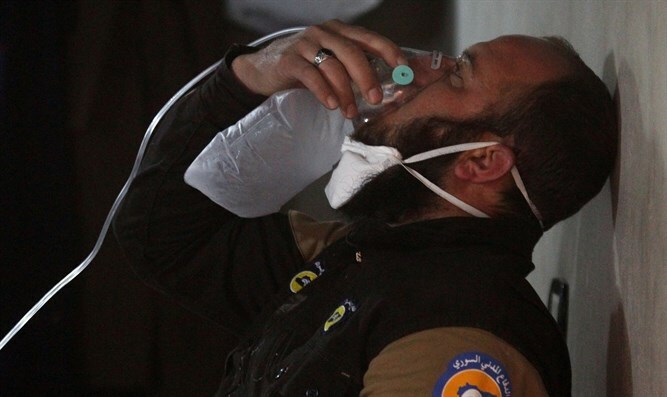 The White House warned Assad that a new chemical weapons attack would not go unpunished. On Tuesday, U.S. defense officials reported that the Pentagon had observed new activity "associated with chemical weapons" at a Syrian aircraft hangar from which the April chemical weapons attack on civilians is believed to have originated. The April attack on the rebel-held town of Khan Sheikhun was reported to have killed at least 87 people, including many children, and images of the dead and of suffering victims provoked global outrage. After a meeting last month with Russian President Vladimir Putin, Macron had drawn a "very clear red line" on the use of chemical weapons in Syria and warned of reprisals. Macron has also said that he sees no legitimate successor to Assad and that France no longer considered his departure a precondition to resolving the six-year conflict.